Fitness Health Match is a social networking platform focused on connecting professionals specializing in fitness, health and wellness with consumers looking for their services in the area using SEO and digital communications tools. Hexfit is a complete interdisciplinary customer tracking solution that streamlines the practices of a variety of healthcare professionals, including kinesiologists, physiotherapists, and now athletic therapists. Easy to use and set up, Hexfit is the definitive software solution to help you streamline your business, increase efficiency and eliminate administrative hassles, so that you can concentrate on what you do best: caring for your clients. Chase Paymentech is Canada’s leading online and credit card payment processor. Be sure you can offer multiple easy-to-accept payment methods, such as credit and debit cards, as well as prepaid cards. With this expertise and knowledge, with best pricing and now with a brilliant mobile app solution, Chase Paymentech helps you deliver the right solution to fit your practice. Visit Chase Paymentech website here! md BriefCase is Canada's foremost on-line, continuing medical education (CME) provider. It provides FREE multimedia, interactive and accredited learning programs. OATA has collaborated on its new concussions module for health care practitioners, OATA members get a discount on the course. Visit md BriefCase website here! BDO Canada is one of Canada’s largest accounting services firms. It serves more than 50,000 clients from Vancouver to St. John’s. BDO was a presenter at the OATA Taking Care of AT Business workshop and will offer a February 2018 Tax Seminar to OATA Members. SSC is the trusted source for all your sports medicine and training room needs. Our specialized products support Professional, Semi Professional & Junior sport teams; Canadian universities, other educational institutions and organizations employ our products daily to ensure top player performance. Pleased to support OATA. Trisura is a Specialty Lines insurance company with offices across Canada, and well positioned to satisfy mid-market risks in Contract & Commercial Surety, Directors’ and Officers’ Liability, Fidelity, Professional Liability including Media Liability and Warranty products. Hub/ Trisura has been providing exceptional discounts to OATA members for home and car insurance. Great-West Life focuses on improving the financial, physical and mental well-being of Canadians. Its customers across Canada trust it to provide for their financial security needs and to deliver on the promises the company makes. 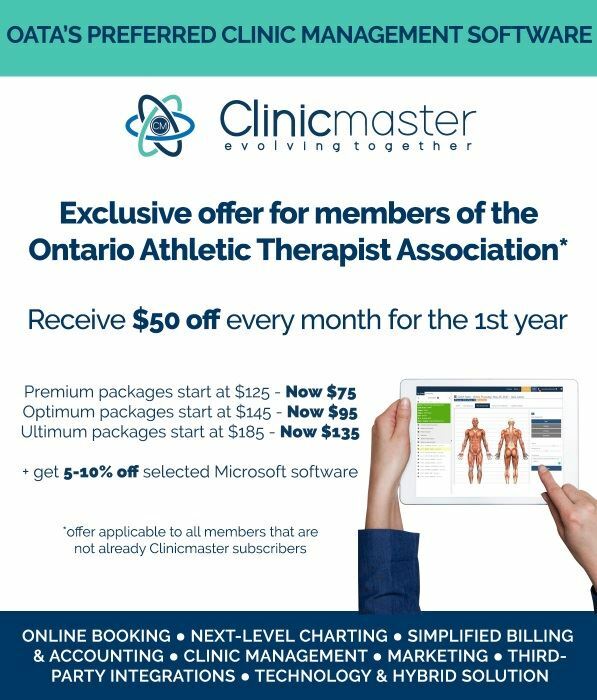 OATA is pleased to offer members well-priced extended health benefits for sole practitioners and clinics with 10 or less professionals staff. Visit Great-West Life website here!